This article is set in the socially fluid context of a northern frontier town in the nineteenth-century Cape Colony. It examines the identity of James Rait, the young teacher at Colesberg Government School from 1849-1858. Rait was charged with implementing the complex curriculum of the New System of state education which had been introduced to the colony in 1839. Both the curriculum and textbooks were strongly rooted in Scottish educational discourses and this article investigates the teacher as mediator of a particular construction of knowledge and dispositions. It reflects on this role as the teacher who taught over 100 children of diverse cultural, class and racial backgrounds. It also examines the teacher's attempts to manage his growing incapacity to sustain a respectable manly identity. This was because of the incommensurate demands of his career and family on his ailing body and limited income. Disease can be seen to feminise the body; and while illness increasingly removed Rait from his classroom, his wife and particularly his female assistant were to bridge the domestic and working worlds and make up for his deficiency. Keywords: liberal education; state education; colonial project; government teachers; nineteenth-century Cape Colony; Colesberg; race; gender; health. Hierdie artikel is 'n ondersoek na die sosiaal vloeibare konteks van 'n noordelike Kaapkolonie grensdorp in die midde-negentiende eeu. Daar word ondersoek ingestel na die identiteit van die jeugdige James Rait, wat tussen 1849 en 1858 onderwyser by Colesberg se Staatskool was. Rait is belas met die implementering van die "New System" van staatsonderrig se komplekse leerplan wat in 1839 in die kolonie ingestel is. Sowel die leerplan as die handboeke is sterk binne Skotse opvoedkundige diskoerse gewortel. En dus is daar n ondersoek in hierdie artikel van hoe die onderwyser as bemiddelaar van n besondere samestelling van kennis en geaardhede optree. Daar word gereflekteer oor die rol van die onderwyser wat aan 100 kinders van uiteenlopende kulturele, klas- en ras-agtergronde moes onderrig gee. Die artikel stel ondersoek in na die onderwyser se groeiende onbekwaamheid in sy pogings om 'n ordentlike manlike identiteit te handhaaf as gevolg van die oneweredige eise van sy loopbaan en familie op sy liggaamlike ongesteldheid en beperkte inkomste. Siekte word hier beskou as die vervrouliking van die liggaam. Terwyl siekte toenemend Rait van sy klaskamer weggehou het, het sy vrou en in besonder sy vroulike assistent die wêrelde tussen die huislike en die werkende oorbrug om sodoende vir sy gebrek te kompenseer. Sleutelwoorde: liberale opvoedkunde; staatsonderrig; koloniale projek; regeringsonderwysers; negentiende-eeuse Kaapkolonie; Colesberg; ras; geslag; gesondheid. In May 1849, the Scottish-born assistant teacher at the Stellenbosch Government School, James Rait, was promoted to the remote Karoo village of Colesberg. To be a government teacher at the Cape Colony in the mid-nineteenth century was to assume a position associated with high status and respectability within the colonial order.2 Government schooling was, however, a novel project in the British Empire.3 The failure of the metropolitan government to commit sufficient resources to make state schooling work meant that the ability of government teachers to sustain a respectable identity varied. It became local circumstances rather than colonial or metropolitan ambitions which set the parameters within which teachers established, defended and performed their own identity. This article provides a case study in which the career of James Rait at Colesberg is used to explore teacher identity in the context of a small northern frontier town. An important document survives from Rait's tenure; his "Report ... for the Quarter ending 30th September 1851".4 Its pages allow access to Colesberg pupils and particularly to the way in which the curriculum was implemented. This article thus investigates the teacher as mediator of a particular construction of knowledge, attitudes and dispositions in frontier Colesberg. It also examines his attempts to manage his growing incapacity to sustain a respectable and successful manly identity. This was because of the incommensurate demands of his career and family on his ailing body and limited income. As Rait's illness advanced, he was granted permission to employ one of his senior pupils, Eliza Arnot, as a paid pupil-teacher. What makes her role significant is that she is one of very few young women to be given a formal, if junior, position within state education. In addition, the racial mix of her family was notable. This case study thus examines teacher identity within an important colonial project. At the same time it opens up a local view of the workings of race, gender and class in a more fluid social context than that of many of the contemporary government schools. The New System was the brainchild of the colonial secretary, John Bell, his fellow Scot John Fairbairn, and the visiting English astronomer, Sir John Herschel;8 its conception liberal, utilitarian, moralising. As evident in the article's opening quotation, Herschel was regarded as the prime author of the system, and his construction of the ideal teacher of the New System was one which resonated with the Graaff-Reinet teacher and with James Rait, the subject of this article. The efficiency of the system, Herschel argued, would hinge on having "talented", knowledgeable teachers, men of sound Christian character; men who would be rewarded financially and through promotion for seeking their own improvement.9 His good teacher was eventually to be epitomised by the graduate of a Scottish university - with a classical or mathematical degree. This vision was reinforced by another Scot, James Rose Innes, who was appointed as the first superintendent-general of education (SGE) in 1839. In his selection and supervision of the first-class government teachers, it is evident that Innes demanded high levels of academic proficiency. Part of this was to ensure that they were able to pass a thorough examination on the curriculum to be delivered, which was based on the Edinburgh published Chambers's Educational Course.10 He also steadfastly refused to promote any who failed to achieve this qualification.11 James Rait clearly met the SGE's exacting criteria and was promoted to Colesberg in 1849. From the 1840s, a "new era of imperial expansion" was evident in southern Africa, driven by the rise of local rural capital.18 The market value of hitherto undesirable semi-desert Karoo land in the Colesberg area escalated rapidly with the introduction of merino sheep and the wool boom of the 1840s and 1850s.19 As sheep farming flourished many Colesberg merchants also became landowners. Some farmed, others bought speculatively on both sides of the river.20 Generally the 1850s (the time of Rait's incumbency) were prosperous. This was until Colesberg, like much of the Cape Colony, was devastated by the drought and famine of the 1860s. James Rait was a 26-year-old bachelor in 1849 when he became the third teacher to take up the first-class government post. He appears to have had a sense of vocation, referring to educating "the Rising generation" as entailing "important duties" and a "sacred responsibility". 26 He was able both to deliver the higher branches,27 and achieve good results with a large number of pupils ranged across the five classes of the elementary section of his school. Evidence of this was a rapid rise in enrolled scholars from 29 in September 1849 (five months after his arrival) to 101 a year later.28 In carrying out his duties, he received gratifying support from the local authorities. There are two clues as to the circumstances. A petition written by the deacons of the coloured congregation of the Union Chapel in Port Elizabeth on 22 February 1856, protested at the their exclusion from the government school in that town, and pointed to a similar situation having occurred in Uitenhage and Colesberg: "it create there only Animosity stil there was Redress also in Colesberg an thare of couse the same feeling stil thare. '34 This petition importantly shows a bid by coloured Christian leaders for their inclusion in the educational dispensation that was theirs by right. To show the working of the system: a coloured man in one of the country towns had his child first educated at the mission school, but, being able to pay for the higher branches, was anxious that his child should join the Government school. This created great excitement among the European population, and the matter was referred to me. My reply was, that the parent could no more be deprived of the privileges of the Government school than of the court of justice when he had to plead his rights. The child was, in consequence, at once admitted, and, in half an hour, twenty-eight of the European children left the school. This was subsequently thought better of, and the children returned, whilst the coloured child remained. Do you not think that if firmness were calmly exercised in every instance of this kind, objections would gradually give way, especially if the teacher were successful?35 (my emphasis). The legal position was clear, but it took endurance to remain in a school where you were not wanted. As Revd Thompson said, "I believe that where something of the kind has been tried, the children themselves have been as like speckled birds; they have found themselves very uncomfortable 36At Colesberg it was apparently possible to endure this, nonetheless. It is not clear how many coloured children attended at Colesberg, but those on the roll who may have belonged to coloured families include M. Bloem, M. Jantjies, R. Sapphira and David Struis. 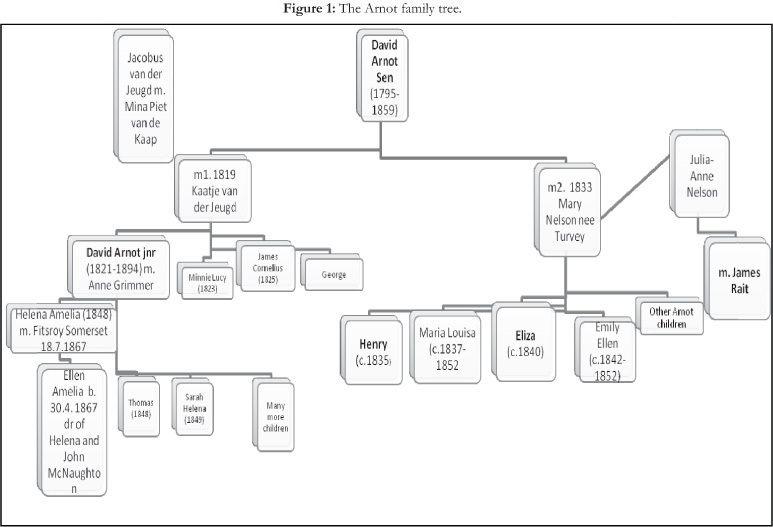 The four Arnot children on the list had white parents but coloured half-siblings because their father, David Arnot snr's, first marriage had been to a Bethelsdorp resident, Catharina (or Kaatje) van der Jeugd, daughter of Jacobus van der Jeugd and Mina Piet van de Kaap. Catharina van der Jeugd was mother of David Arnot jnr, born in 1821. 37 See Figure 1. From early on, Rait's classroom was filled to capacity with children, seemingly of all ages, genders and races. In his discussion of pedagogic space, Vihao points out the relationship between prevailing pedagogy and the organisation of this space. A school's space can be seen to perform three functions - productive, symbolic and disciplinary.42 An overcrowded and ill furnished schoolroom would be unable to fill any of these roles satisfactorily. Thus, urged on by teacher and local school commission, the government approved the construction of a new schoolroom on the same site, erf 22 Ryneveld Street, in the centre of the village.43 By October 1850, occupation was taken of one of the larger government schoolrooms: 7' by 25' and a lofty 20' in height.44 Its interior was whitewashed, its floor made of stone, and it was furnished with writing desks around the periphery and forms across the room. This was an important if modest specialised space. By the time Rait was teaching, the monitorial system employed in earlier forms of local schooling was no longer in favour. It was seen to have sacrificed real learning to mindless discipline. Instead, the teachers of the government schools engaged essentially in class teaching - "classification" resulting in five elementary classes, though there was no ascription of age to a particular level or rate of proceeding from one to the next. Advancement through the educational course was thus more flexible than in later systems of classroom based teaching. The Colesberg School had only one room, and continued the practice in preindustrial settings of placing all pupils in one space.45 There was an integrated organisation of time and space where time was categorised as "Time under the Master"; "Time under the Assistant or Monitor"; and "Preparing at the Desk"46 (see Figure 2). Activity would shift around the room in relation to this categorisation. The school day, as in all government schools, was from 9am to 12 noon and 2pm to 4pm. In 1851, there were 101 pupils spread fairly evenly over the five classes of the elementary school. (In addition, there were five pupils taking the higher branches for which they would pay the quarterly fee of £1). Three classes made up the Junior Division, the 1st being the most junior; there were two classes in the Senior Division, where again the 1st was junior to the 2nd. Children were not obliged to be at school, however, a frustrating source of irregularity that most schoolmasters bemoaned. As the years passed, the school seems to have increased proportionately in younger children, mostly Dutch-speaking, and from families less committed than his original intake to obtaining more than a basic education.50 With continuing large numbers and his declining health, Rait was hard-pressed to continue with provision of the higher branches, although he had three pupils engaged in these studies in 1855.51 It was only as his illness became critical by 1856, that Rait acquired the formal services of Eliza Arnot as a paid pupil-teacher. Rait's itemisation in his 1851 report of the subjects studied and the Chambers texts used in his classes, provides an opportunity to engage with the discourses these represent. It offers a glimpse at the intriguing interplay between the Scottish context and worldview in which they were constructed and the children of the town and district, Colesberg, that has been presented thus far. The introduction of the Chambers's Course into Cape classrooms, as the defining way in which the curriculum of the New System was implemented, brought with it "rules and standards by which to 'reason' about [the] world"; a vocabulary, subject matter and a frame of reference that was Scottish and British. Not only were subjects taught, but also "dispositions, awareness and sensibilities".57 To the extent that they acquired the educational discourses in the limited time they stayed at school, the children of Colesberg were absorbing the knowledge and social rules to shape their identities as male or female subjects of the British Empire. In the books Rait used and the content he taught, there were messages that cohered with a rational and inclusive identity. At the same time there was much that naturalised acceptance of a gendered, hierarchical social order, British civilisation and imperial power. The pedagogy used is not recorded, but a teacher or assistant might follow the guidelines supplied at the beginning of each of the Chambers texts. Thus the Colesberg beginner reading class of over 20 children might learn to form their letters by copying the teacher in inscribing them in chalk on their boards. Following a phonic rather than alphabetical system, they would also learn to sound these by using them in words. "Let the vowels be sounded boldly, and the consonants with a considerable emission of breath." 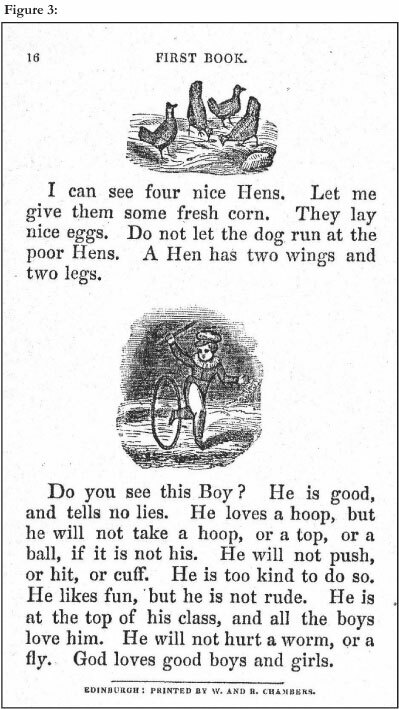 Pronunciation was important, and in order to help children "really understand the idea represented by the word employed", they should be provided a mental image through "object, experiment, drawing, pantomime, anecdote" and the like.58 Words were generally learnt in isolation and only put together meaningfully at the end of the book as "Lessons of Mixed Words". The second story below typifies those in the Chambers readers; an engraved illustration is accompanied by a text relating in part to the world of children while at the same time conveying a moral message which positions them as either "good" or "bad". See Figure 3. The Second Book of Reading has a similar methodology though denser texts. In the stories, "God is good, and great, and wise"; "We should be kind to animals"; "Sheep are pretty and innocent animals". The stories are gendered and straddle respectable working class and middle class discourses. A "pretty little girl" feeds chickens in one story, in another a girl stands by "in a clean white frock", ready to water the garden which is being tended by a man and a boy. The second class of the Junior Division of Colesberg Government School was engaged, in 1851, in reading from the third reader in the Chambers's Educational Course. It was called Simple Lessons in Reading, and continued in the same vein as the earlier readers. Its preface states that developing the art of reading and spelling is intended to prepare the child "for methodic intellectual culture in the books which follow". Some people live in the country in "cottages", but most people live in houses near each other in "villages, towns", and "cities". Family and nationality are explained. Hard work and property ownership are to be valued without sacrificing modesty, humility and an understanding that poverty comes from misfortune, old age or illness and not only as a consequence of idleness. The topics dealing with the natural world move pupils towards some elementary categorisation, and include animals, wood and trees, water and "objects". Arithmetic formed part of each day's schedule for all five elementary classes, and Chambers's Introduction to Arithmetic appears to have been written for the teacher rather than pupils.64 It sets out a rule-based methodology with detailed, wordy instructions and explanations on addition, subtraction, multiplication and division. Tables and exercises are included, the latter showing the application of arithmetic to daily life and a mercantile future.All five classes spent some time doing Geography, mostly with the monitor - capitals, in the case of the second class, and principal lakes, rivers, mountains and "the World" in the third. It was at this stage, therefore, that government school pupils were introduced to the analytical thinking that the scientists of the era were engaged in. While the senior class paid attention to "Matter and Motion", and "Hydrostatics", there was a particular emphasis, in the September 1851 examination, on "Cuvier's Arrangement of the Animal Kingdom".66 Chambers (who was to undertake an anonymous investigation of his own into the evolution of species)67 entitled the section, "The Animal Creation". The introductory paragraph would surely have stymied most ten-year olds, particularly those for whom English was used only at school. It nevertheless demonstrates the movement into evolutionary thinking. Thus might the Colesberg children be disposed to interpret disruptive events on the not too distant frontiers of their own colony - the Kat River Rebellion and the War of Mlanjeni (8th Frontier War of 1850) - as unwarranted resistance to the inevitable expansion of British civilisation? Rait provided a clear statement of his entitlement, claiming his achievements to equal those of "Schools to which Two Hundred pounds per annum is attached" - in other words the best remunerated schools at which the teachers initially selected by Herschel himself had been placed. These included Stellenbosch (Rait's own school) and nearby Graaff-Reinet. He justified an increase in salary through his high numbers (95- 100) and by the progress of his pupils. His third point was that the cost of living in Colesberg would make it impossible, "were I married, to maintain that status in society which my situation entitles me to hold". The salaries of Civil servants ... mark to a considerable extent their status, ... it is not in human nature, that a service should carry with it any show of public respect, which is considered inadequately remunerated by a salary barely sufficient to maintain an individual, insufficient for a family, and accompanied by no power, no privilege, no honorary circumstance whatever of any description, but on the contrary associated with proverbial drudgery76 (my emphasis). Rait was demonstrating a familiarity with the origins of the New System and, surely, hoping to show up "government" if it failed in its own commitments. James Rait's identity as a married man, with responsibilities to support his family in a matter fitting for his situation and status sat heavily with him all the time. The theme of financial stress continued throughout his career, although somewhat alleviated by increases in 1855 and 1857 which left him with an annual salary of £150.81 The sense existed that respectability was a precarious status to maintain given the financial demands on a small salary. The granting of a gratuity as a result of persuasive performance in a public examination, or through convincing statistical information, could help to promote short-term security. The loss of pupils if parents did not bother to send them to school could imperil his enterprise. Rait was sure that his performance was equal to that of any other teacher in the New System but it was a status that would be further threatened by poor health, as we shall see. Historian of the British Raj, E.M.Collingham notes that the British experience of India was intensely physical, assailing all senses. Values, attitudes and ideologies were literally embodied.92 It is "clear ... that the body was central to the colonial experience ... as the site where social structures are experienced, transmuted and projected back on society ..."93 How, then, might Rait, with his sickening body be seen? Collingham demonstrates the "burden on the physique" of the British official in India, resultant from long hours of bureaucratic duties94 and Rait may likewise be seen to carry in his body the demands of the educational state. While he could convince everyone - pupils, parents, school commissioners, SGE - of his moral reputation and conscientiousness, the large numbers of pupils of differing ages, the huge range of subjects to be taught, and the lack of effective assistance weakened his resistance such that the random occurrence of a TB bacillus was able to take hold and sap his vitality. Rait's illness ended in his death in 1858, but was arguably just an intensification of the malaise that affected many government teachers, and the SGE himself. The complaints of fatigue and bodily ailments resulting from the arduous duties of teaching and supervising in the New System are too many to be glossed over. Rait also came to carry in his body the impact of the environment and the temporal and spatial separation of the town from adequate medical care. This is most poignantly conveyed in the image of the weakened teacher being jolted to and from Port Elizabeth in Mr Grant's cart in December 1856 "to secure a change of air and scene for a short time, and to obtain better medical aid than can be got in Colesberg". It is captured, too, in his final journey to Queenstown in November 1857, from which the CC Rawstorne feared there was "very faint hope of his return or recovery".95 His illness weakened him and affected his ability to deliver - to the point where two women stepped in to provide what he was expected to provide - education for his charges and support for his family. Disease can be seen to feminise the body, and while illness increasingly confined Rait to a private space, his female assistant and his wife, Julia-Anne (neé Nelson), were to bridge the domestic and working worlds.96 As his illness progressed, "Mrs Rait, by teaching at a female school, contribute[d] considerably to the support of the family".97 Sixteen-year-old Eliza became a paid pupil-teacher in the government school in 1856. The rationale for Eliza Arnot's appointment was "the very considerable number of Girls as well as Young Children" at the school.98 The appointment of a senior pupil, one of only three engaged in the higher branches in 1855, offers an opportunity to reflect on a different teacher identity at Colesberg; that of the woman teacher. Writing about nineteenth-century Australia, Marjorie Theobald makes the point that women teachers were often present but invisible, teaching in the seclusion of private homes, and later in ladies academies.99 She also notes the opacity of sources about them and the need for the historian to work with very little in trying to construct their lives.100 This is true for Eliza Arnot, from whom no word is heard in the ten years that she acted as pupil-teacher and assistant teacher at Colesberg. Her career is pieced together from the limited references of the men who supervised her, at home and in the school system. What we do know is that Eliza was not only Rait's assistant teacher, but also his step-sister-in-law. Figure 1 sets this out diagrammatically. It is possible to gain a fair sense of Eliza's own education because she was for at least six years a pupil in the government school. In 1851 she was listed as a pupil, along with three of her siblings.101 What is interesting about Eliza Arnot is the unusual trajectory of her educational career. As daughter of an independent artisan, she would perhaps have been expected to acquire a basic level of literacy, marry young and run her own home. The existence of a free government school, mixed because it was located in a small town, created unusual opportunities for her to be taught, not simply trained. (This was a distinction Innes made). This, and the financial contribution of her older half-brother. The moral influence and helping presence, first of female pupil-teachers and later women teachers under male leadership, gradually came to be regarded as desirable, however. Eliza Arnot clearly had the academic skills which would have been accepted in any aspiring male pupil-teacher and we have noted the urgent need of assistance for the government teachers. Innes seems not to have hesitated to recommend senior girl pupils to such assistant posts when the need and opportunity arose. Regarding it an economic necessity in smaller centres to continue with co-educational or "mixed" schooling, Innes and his successor, Langham Dale, were both nervous of its moral implications when teachers were men alone.111 Although the Colesberg school remained too small to develop separate boys' and girls' sections, the appointment of Eliza Arnot under Rait and subsequent male head teachers was in line with Stow's moralising "family model" of schooling 112 emerging both in Scotland and at the Cape from the end of the 1850s. Little was subsequently written of Eliza Arnot's career, but the evidence of Rait's periodic absences from the school in late 1856 and early 1857 suggests that she may have had to compensate a great deal for his frailty.113 When Rait left Colesberg in November 1857, Eliza temporarily assumed the responsibilities of a head teacher, by implication a male teacher. This was permitted at moments of crisis but she was never paid more than the allowance given a female teacher who was assumed to have family support. This article has offered a cameo of a young male teacher with the self-image of a respectable and dedicated improver of minds. In attempting to carry out the full requirements of the New System, he was backed by school commissioners who similarly valued the educational improvement of all races and classes in Colesberg. Judged by the numbers in his school and the respect he earned, Rait achieved periods of success in this socially fluid setting. The strain, however, placed by his duties and financial insecurity on his emotions and physique demonstrate a feminisation of a manly middle class married man. At the same time the affordance of the New System in this small town was a liberal education for a young woman. The illness, death and dismissal of her male superiors and the general shortage of qualified teachers in the Cape Colony provided a contingent opportunity for her to step into the bounded world of first-class school teaching. But despite her academic and moral credentials, the dominant discourses of quality education did not allow a woman to head a school with boys in it - in other words to do permanently what she was permitted to do periodically. Eliza Arnot's teaching career appears to have then ended but it had nevertheless presaged the move from one-man schools to those which catered for children of all ages and genders in a more complex establishment. * Helen Ludlow is head of History and of the Division of Social and Economic Sciences at the Wits School of Education, University of the Witwatersrand. Her research has focused on the nineteenth-century Cape Colony, including missions, slave emancipation, and teacher identity. 1. "The Karoo College", The Midland Province Banner, Graaff-Reinet, 18 August 1858. 2. The first "New System" government teachers took up their posts in 1840, and the last resigned in 1874. Cape Archives (hereafter CA): Superintendent-General of Education (hereafter SGE), 13/1, General Register of Schools, 1838-1875; SGE 17/2, Schedule of the Establishment in the Department of the SGE, 1863-1875. 3. The first engagement of the British state with direct provision of education was in Ireland but was limited before the New System was introduced at the Cape. See J. Coolahan, Irish Education: Its History and Structure (Institute of Public Administration, Dublin, 1981), pp 3-5. 4. CA: SGE 1/4, Letters received by the Superintendent-General of Education, 1851-1859, from Humansdorp, Uitenhage, Port Elizabeth, Bathurst, Grahamstown, Cradock, Graaff-Reinet, Colesberg, etc. ; J. Rait "Report of the School established by Government at Colesberg for the Quarter ending 30th September 1851". 5. For an overview of earlier education provision, see G.24-'63, CGH, Report of a Commission of Inquiry, in Accordance with Addresses of the Legislative Council and House of Assembly, to Inquire into the Government Educational System (hereafter Report of Watermeyer Commission), 1861, pp xi-xxviii. 6. E.H. Ludlow, "State Schooling and the Cultural Construction of Teacher Identity in the Cape Colony, 1839-1865", PhD thesis, University of Cape Town, 2011, chapter 2. 7. CGH, J. Fairbairn, A1SC-1857, Report of the Select Committee Appointed to Consider the Subject of Education, p v. There were eventually 21 government schools, of which 17 were first-class i.e. provided for the education of secondary as well as elementary pupils. 8. Report of Watermeyer Commission, 1861, pp xxxii-xi; E.G. Malherbe, Education in South Africa, Volume 1: 1652-1922 (Juta, Cape Town and Johannesburg, 1925), pp 86-87. 9. J. Herschel, "Memorandum", 17 February 1838, in W.T. Ferguson and R.F.M. Immelman (comps), Sir John Herschel and Education at the Cape, 1834-1840 (Oxford University Press, Cape Town, 1961), pp 14-25. 10. CA: Colonial Office (hereafter CO) 695, Memorial of J. McNaughton, 31 August 1857. 11. For example, CA: CO 499, Innes - Acting Colonial Secretary, 9 August 1841. 12. The Khoisan (Nama) name for the river was the Gariep, and the area to its north became known as the Transgariep. Going "across the river" seems to have become shorthand for Colesbergers visiting anywhere in the Transgariep. The end of 1853, for exmple, found the teacher James Rait "over the river" because it was the holidays. CA: SGE 1/4, Rait - Innes, 1 February 1854. 14. CA: 1/Colesberg (hereafter CBG), Inventory of the Archive of the Magistrate of Colesberg, "Introduction", pp 1, 4. 15. Governor Sir Harry Smith's precipitous extension of the colonial boundaries within months of his appointment in 1847 incorporated the Colesberg Division in a colony which doubled in size. Thousands of acres of crown land were added as the boundaries of the colony were extended to the full length of the Orange River in 1848, marking a closure of the political frontier. See H. Giliomee and B. Mbenga (eds), New History of South Africa (Tafelberg, Cape Town, 2007), p 144. 16. T. Gutsche, The Microcosm (Howard Timmins, Cape Town, 1968), pp 85-90 and 101-105, for example. 17. Gutsche's Microcosm is the only detailed, though unreferenced, history of Colesberg. For many examples of gunpowder licences granted, see CA: 1/CBG/4/2/4, 5, 6, Letters received by the Resident Magistrate, Colesberg, December 1850-December 1853. 18. M. Legassick and R. Ross, "From Slave Economy to Settler Capitalism: The Cape Colony and its Extensions, 1800-1854", in C. Hamilton, B. Mbenga and R. Ross (eds), Cambridge History of South Africa, Volume 1 (Cambridge University Press, New York, 2010), p 316. 19. Giliomee and Mbenga (eds), New History of South Africa, p 145. 20. Gutsche, Microcosm, p 84. 21. "Return of the Extent, Population, and Stock, of the Colony of the Cape of Good Hope for the year 1841", cited in W.L. Nell, "James Rose Innes as Educationist at the Cape, 1822-1884", DEd thesis, University of Stellenbosch, 1973, p 497. 22. CA: CO 518, Revd T. Reid - Innes, 25 November 1843. Unusually for this time, the local DRC congregation played a limited role in the town's education because it was riven by schism during much of the 1840s and 1850s; Gutsche, Microcosm, p 100. 23. Rait, "Report of the School", 30 September 1851, notes pupils withdrawn to attend a "Female School". 24. Gutsche, Microcosm, p 117; CA: SGE 1/4, A. Noble - Innes, 24 June 1858. 25. Cape of Good Hope (hereafter CGH), "Answer from H. Green Esq., Colesberg", 31 December 1861; Report of Watermeyer Commission, 1861, Appendix 1, p 39. 26. CA: SGE 1/4, Rait - President of School Commission, 12 March 1852; Rait - Innes, 21 April 1853. 27. The higher branches were subjects like the classics and mathematics studied by secondary-level pupils. See for example, Eliza Arnot's curriculum below. 28. CA: SGE 1/4, Rait - President of School Commission, 1 August 1854. 29. CA: SGE 1/9, Miscellaneous letters received by the SGE, 1861 (all districts), J.B. Tennant - Dale, 23 and 27 March 1861. 30. J.S. Marais, The Cape Coloured People, 1652-1937 (Wits University Press, Johannesburg, 1957), pp 20-22; M. Legassick, "The Northern Frontier to c. 1840: The Rise and Decline of the Griqua People", in R. Elphick and H. Gilliomee (eds), The Shaping of South African Society (Maskew Miller Longman, Cape Town, 1989), pp 361-363. 31. J.M. Orpen, Reminiscences of Life in South Africa from 1846 to the Present Day, Volume 1 (P. Davis, Durban, 1908; Struik reprint, Cape Town, 1964), p 39. 32. CA: G.16-'57, CGH, Report on Public Education for 1855 and First Half of 1856, p 30. 33. CA: CO 594, Rait - President of School Commission, 16 August 1850. 34. CA: SGE 1/4, Deacons of Union Chapel - Innes, 22 February 1856. 35. CA: G.24-'63, Report of Watermeyer Commission, p 124; Innes for Commissioners, 4 December 1861. 36. CA: G.24-'63, Report of Watermeyer Commission, p 125; Revd W. Thompson, 4 December 1861. 37. J.A. Heese and R.J.J. Lombard, South African Genealogies, Volume 1 (HSRC, Pretoria, 1986), p 84. 39. Orpen, Reminiscences, p 2. 40. 'C.E.H. Orpen', Dictionary of South African Biography, Volume 4 (HSRC, Pretoria, 1981), p 437. Local school commissions had powers to inspect and report but not to regulate the teacher or manage financial matters. 41. CA: SGE 1/4, C. Orpen - Rawstorne, 12 November 1853. 42. A. Vihao, applying Foucault's three functions of work to a school, "History of Education", in T.S. Popkewitz, B.M. Franklin and M.A. Pereyra (eds), Cultural History and Education: Critical Essays on Knowing and Schooling (Routledge and Falmer, London and New York, 2001), p 132. 43. CA: CO 594, Rait - Colesberg School Commission, 16 April 1850 , 16 August 1850; President of School Board - Col Sec., 21 August 1850. 44. CA: CO 676, Innes - Col Sec., 7 March 1856; G.15-'60, CGH, Report on Public Education for the Year 1859, Table 1, p 11. The linear measurement presumably refers to feet. A foot is equivalent to 30.48 cm. 45. D. Tyack and W. Tobin, "The 'Grammar' of Schooling: Why has it been so Hard to Change?" American Educational Research Journal, 31, 3, 1994, p 458. 46. CA: SGE 1/4. See layout of "Report of the School established by Government at Colesberg for the Quarter ending 30 September 1851." 47. I. Hunter, Rethinking the School: Subjectivity, Bureaucracy, Criticism (Allen & Unwin, St Leonards, 1994), p 73. 48. CA: SGE 1/4, CC Rawstorne - Innes, 16 April 1856. 49. CA: SGE 1/4, Rait - Innes, 1 February 1856. 50. CA: SGE 1/4, Rait - Innes, 1 February 1856. 51. CA: G.16-'57, Report on Public Education for 1855 and the First Haf of 1856, p xxii. 52. B. Waggoner, "Robert Chambers (1802-1871)" (University of Berkeley Palaeontology Museum) at http://www.ucmp.berkeley.edu/history/chambers.html, accessed 15 December 2010. 53. S.M. Cooney, "Publishers for the People: W. and R. Chambers: The Early Years, 1832-1850", PhD thesis, Ohio State University, 1970, pp 153 ff. 54. Cooney, "Publishers for the People", pp 153 ff. 55. Cooney, "Publishers for the People", p 162. 56. Cooney, "Publishers for the People", pp 172 and 208. 57. T.S. Popkewitz, "The Production of Reason and Power", in T.S. Popkewitz et al (eds), Cultural History and Education, pp 152-164. 58. W. Chambers and R. Chambers (eds), Preface to First Book of Reading (William & Robert Chambers, Edinburgh, 1845). 59. W. Chambers and R. Chambers, Preface to Simple Lessons in Reading (William & Robert Chambers, Edinburgh, 1845). 60. Chambers and Chambers, Preface to Simple Lessons in Reading. 61. Chambers and Chambers, Preface to Simple Lessons in Reading p 38. 62. W. Chambers and R. Chambers, Rudiments of Knowledge (William & Robert Chambers, Edinburgh, 1848), p 14. 63. Chambers and Chambers, Rudiments of Knowledge, pp 73-74. 64. W. Chambers and R. Chambers, Introduction to Arithmetic (William & Robert Chambers, Edinburgh, 1843). 65. W. Chambers and R. Chambers, Preface to Introduction to the Sciences (William & Robert Chambers, Edinburgh, 1843). Cooney identifies Robert Chambers as the author of this book, as well as The History of the British Empire. See Cooney, "Publishers for the People", p 201. 66. Cuvier was a pre-Darwinian animal anatomist and palaeontologist whose work on classification was current at the time Chambers wrote the textbook. He challenged Lamark's work on gradual evolution but believed hard evidence to show that extinctions had occurred. This was a challenge to those who felt that God had made everything perfect and if a species no longer existed in Europe it must exist elsewhere. See B. Waggoner, "Georges Cuvier (1789-1832)", at http://www.ucmp.berkeley.edu/history/cuvier.html accessed 1 May 2010. 67. R. Chambers, Vestiges of the Natural History of Creation (1844; Reprinted by J. Secord (ed. ), University of Chicago Press, Chicago, 1994). 68. Chambers and Chambers, Introduction to Sciences, p 97. 69. CA: SGE 1/4, Orpen - Rawstorne, 12 November 1853. 70. Chambers and Chambers, Introduction to Sciences, pp 117-118. 72. R. Chambers, History and Present State of the British Empire (William & Robert Chambers, Edinburgh, 1874), p 246. 73. Chambers, History of the British Empire, pp 77-78. 74. Chambers, History of the British Empire, pp 256 and 263. 75. CA: CO 594, Rait - President and members of the Local School Commission, Colesberg, 12 March 1852. 76. Rait was citing the "Memorandum" dated 17 February 1838, in Ferguson and Immelman (comps), Sir John Herschel, pp 14-25. 77. CA: CO 594, President of School Commission - Col Sec., 1 April 1852. 78. CA: CO 594, Innes's "Report" on President of School Commission - Col Sec., 1 April 1852. 79. CA: CO 695, Innes - Col Sec., 19 March 1857, attached Dr James Abercrombie, 19 March 1857; John Laing, Surgeon, 19 March 1857. 80. CA: SGE 1/4, Rait - President of the Local School Commission, Colesberg, 1 August 1854. 81. A1SC-1857, Report on Subject of Education, p 34; Innes - Select Committee, 12 May 1857; CA: CO 695, Innes - Col Sec., 29 August, 1857. 82. CA: SGE 1/4, Rait - Colesberg School Commission, 1 August 1854. 83. A1SC-1857, CGH, Appendix to the Report of the Select Committee on Education, November 1857, pp 7-8; Rait, "Report of Colesberg School", September 1851. 84. CA: SGE 1/4, Rait - Innes, 21 April 1853. 85. CA: SGE 1/4, President of School Commission, Colesberg - Innes, 10 May 1853. 86. Irritability was expressed, for example, with Innes's rather surprised clerk, a Mr Jarvis, for sending a request for information in a way that Rait interpreted as uncivil and abrupt. CA: SGE 1/4, Rait - Clerk to the SGE, 7 December 1853. 87. CA: SGE 1/4, Rait - Innes, 18 April 1855. 88. CA: SGE 1/4, Rait - Innes, 18 April 1855. Attached copy. 89. C.E. Forth, Masculinity in the Modern West: Gender, Civilization and the Body (Palgrave Macmillan, Basingstoke and New York, 2008), pp 72-73. 90. Forth, Masculinity in the Modern West, p 81. 91. Fairbairn, "Report of Select Committee on Education, 1857", 12 May 1857, pp 33-34. 92. E.M. Collingham, Imperial Bodies: The Physical Experience of the Raj, c. 1800-1947 (Polity, Cambridge, 2001), p 3. 93. Collingham, Imperial Bodies, p 2. 94. Collingham, Imperial Bodies, pp 124 and 142. 95. CA: SGE 1/4, Rait - Innes, 1 December 1856; Rawstorne - Innes, 10 November 1857. 96. Rait married Julia-Anne Nelson in 1851. 97. CA: SGE 1/4, Rait - Innes, 15 May 1857. 98. CA: CO 676, Innes - Col Sec., 23 April 1856. 99. M. Theobald, Knowing Women: Origins of Women's Education in Nineteenth-century Australia (Cambridge, Cambridge University Press, 1996), pp 2-3. 100. Theobald, Knowing Women, p 4. 101. CA: SGE 1/4, Rait, "Report of Colesberg School", September 1851. 102. He was an affluent general agent, keeper of the town's gunpowder store, sometime school commissioner, J.P., musician, collector of botanical specimens, and eventually father of twelve. See Gutsche, Microcosm, pp 85, 91, 95, 117-119, 137-138; CA: 1/CBG/4/2/6, Letters Received by Resident Magistrate of Colesberg, 1854, David Arnot - Clerk to Resident Magistrate, 15 November 1854. 103. CA: SGE 1/4, Rait - Innes, 1 February 1856. 104. CA: CO 676, Innes - Col Sec., 23 April 1856; G.16-1857.Report on Public Education for 1855 and First Half of 1856, p xxii. 105. Theobald, Knowing Women, pp 15-16. Helen (also called Ellen) was born in 1848 and so eight years younger than Eliza. Granddaughter of Kaatje van der Jeugd of Bethelsdorp, she was sent at the age of five to Miss Wilmot's Select Academy for Young Ladies in Wynberg. She returned to Colesberg as a fine musician and eventually married the effete grandson of Lord Charles Somerset, sealing her status as a lady. See Gutsche, Miscrocosm, p 147. 106. CA: SGE 1/4, Innes - Rait, 4 February 1856. 107. When it was suggested that "the most advanced pupil" at the Beaufort West Government School, Margaret McNaughton, be employed as a pupil-teacher, Lieut-Governor Darling vetoed the idea on the grounds of her gender. See CA: CO 622, Margin note, CAD, on Office of SGE - Acting Sec. to Gov., 19 March 1853. 108. Theobald, Knowing Women, pp 19-20. 109. Theobald, Knowing Women, p 26. 110. CA: CO 676, Innes - Col Sec., 11 September 1856. 111. CA: A1SC-1857; CGH, Report of the Select Committee Appointed to Consider the Subject of Education, June 1857, p 30; Innes - Select Committee, 12 May 1857; G.15-'60. 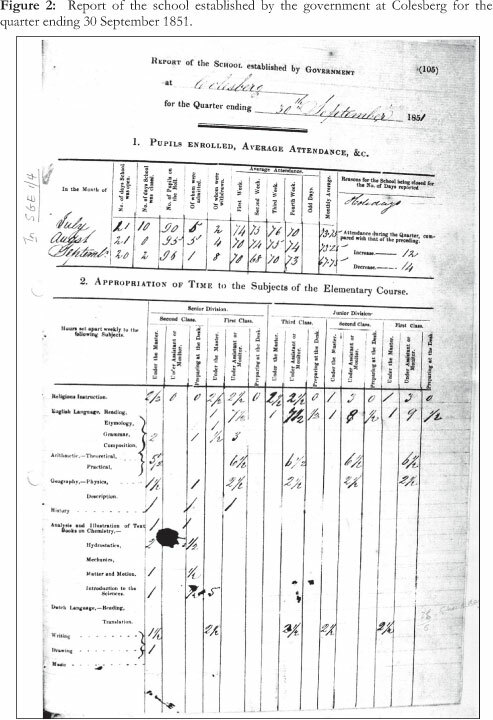 Report on Education for 1860. 112. D. Jones, "The Genealogy of the Urban Schoolteacher", in S. Ball (ed. ), Foucault and Education: Disciplines and Knowledge (Routledge, London, 1990), p 65 ff. 113. CA: SGE 1/4, Rait - Innes, 1 December 1856; Secretary to Divisional Council to Office of SGE, 15 April 1857; Rait - Innes, 15 May 1857. 114. CA: CO 775, Dale - Acting Col Sec., 12 October 1861. 115. CA: CO 791, Office of SGE - Col Sec., 23 August, 17 October 1862. 116. CA: CO 853, Office of SGE - Col Sec., 10 April 1866. 117. CA: CO 870, Office of SGE - Col Sec., 30 November 1867. From 1 October 1871, an additional schoolroom was erected and a female teacher employed to teach the girls. The "Girls School" was awarded a grant of £50 per annum. The headmaster of the Boys School was (remained?) Dr John Shaw. See CA: CO 944, Office of SGE - Col Sec., 5 December 1871. 119. N. da Silva, SA Genealogical Society, personal communication. By contrast the profile of her more famous half-brother, David, was to be raised in the context of the early stages of the southern African mineral revolution. This was as a legal agent successfully defending the claims of the Griqua of Nicolaas Waterboer to the newly found diamond fields.